I should really call this Friday Cinco, since Sunday is Cinco de Mayo. Which is really an excuse to eat guacamole and drink margaritas. As if we need an excuse, right? 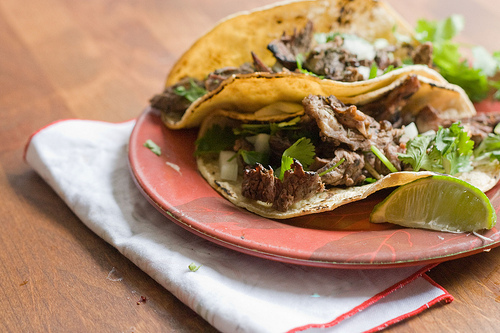 Cinco of my favorite Mexican-themed recipes for your own Cince de Mayo celebration. Or you know, Tuesday. So get in the kitchen, pop open a cerveza, and start the party. I was lucky enough to have lunch this week with the ladies of Vamoos Travel;. If I had some spare dough and some spare time, I would be waiting in line to sign up for one of their amazing luxury culinary tours of Italy. These ladies don’t just plop you in a tour bus and send you to eat pasta in some tourist establishment — they provide all sorts of fantastic experiences, like visiting a artisan who makes Parmigiano Reggiano, or learning to make gnocchi in the kitchen of an Italian grandma. Their next tour is in November, and they only take about 10 people, so they book up fast. One of the loveliest people I got to meet at the Potluck was Lillian of Chinese Grandma. She’s also a great cook – she brought this amazing Roasted Cauliflower to the potluck and I ate TWO helpings (and there was a lot of food). I’ve found during this year of living vegetally that cauliflower is one of the most versatile vegetables, but Lillian’s dish was a knockout. Vamoos Travel – what a dream!